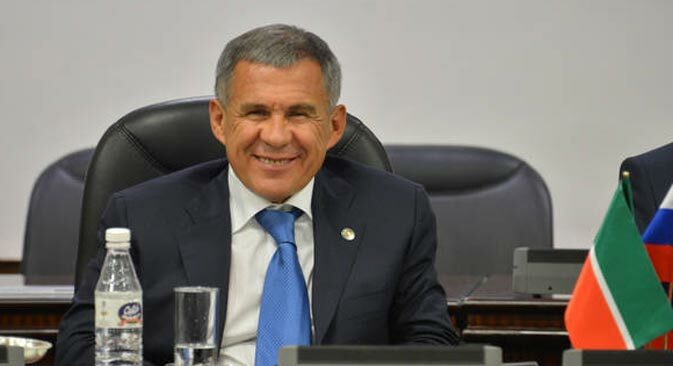 In an exclusive interview with RIR, the president of Tatarstan talks about the immense opportunities that the internal Russian republic offers for Indian businesses. The internal Russian republic of Tatarstan is one of the economic powerhouses in the country. It is also the home of Kamaz, the Kazan Helicopter Factory and a large oil and gas industry. The republic’s president talks to RIR about the opportunities that await Indian businesses in various sectors. Do you value the level of cooperation between India and Tatarstan? What bilateral investment projects do you consider to be the most important and significant for the republic? The Republic of Tatarstan gives great importance to the development of cooperation with Indian partners. By the end of 2013, the trade turnover between Tatarstan and India had increased more than twofold (in comparison with 2012) and totalled about $900 million. We supply helicopters and Kamaz trucks and deliver Tatarstan’s petrochemical products, rubber, mechanical and electrical equipment, wooden and metal products and other products to India. Indian goods are widely represented in our market, including tea, coffee, spices, textiles and pharmaceutical products. We have great potential for cooperation, primarily in the economic sphere. Unfortunately we are not yet making full use of it. Among the priority areas for collaboration are oil refining and petrochemicals, mechanical engineering and machine tool construction, helicopter production, automobile manufacturing and the production of auto parts, IT and other high technologies, pharmaceuticals, textile production, mechanised farming, science and education. We are interested in Indian companies choosing our republic as a place where they can launch their activities in Russia. What can Tatarstan offer Indian businesses? What investment opportunities would you highlight? Tatarstan is one of the leading and most industrially developed regions of the Russian Federation. In our republic, oil is extracted and refined (33 million tonnes/230 million barrels per year, 6.3 percent of the total Russian volume). Petrochemicals are developed, airplanes, helicopters, automobiles, mechanical engineering products, ships, pumping stations, compressors and electric equipment are manufactured here. The republic’s enterprises produce half of Russian polystyrene (55 percent), polyethylene (48 percent), and synthetic rubber (46 percent) and 30 percent of the Russia’s automobile tires and trucks. At Kamaz, a program is being implemented for the full modernization of production and the transition to the creation of a promising family of automobiles meeting global standards. The Kazan Helicopter Factory is preparing new models for release in light and heavy helicopters segment. Modern high-speed passenger ships and ships for the navy are being built at the Gorky Factory. Many of Tatarstan’s projects are being implemented with the participation of foreign partners. We hope that Indian companies will also find their interests in our republic. Can you tell us about the existing cooperation between India and Tatarstan? India is one of the leading customers for the products of the Kazan Helicopter Factory. In total, more than 400 civilian and military-transport helicopters have been supplied to the country and there are more than 70 units at the stage of execution of contact-supply. Also underway are renovations of previously supplied equipment and the training of personnel studying the possibility of creating a service centre in India to be used for repairing Kazan’s helicopters. Starting in 2010, in India (the city of Hosur, state of Tamil Nadu) the assembly production of trucks has been underway with Kamaz having a 100 percent share. In oil refining and petrochemicals there is cooperation between the TAIF group of companies and India’ Reliance Industries Ltd. There is interest in collaboration on projects in the sphere of IT and other high technologies. Tatarstan is one of Russia’s leaders in the sphere of innovative and science-intensive projects and it is also a good platform for innovative production. Are there plans to attract Indian business in this area? We associate the innovative development of the republic with the creation of modern enterprises using the most advanced technology. Today, the most successful Special Economic Zone (SEZ) in Russia, Alabuga, with a total declared investment of more than $3 billion, and the national-scale IT Centre SEZ Innopolis, which is at the stage of intensive formation are located in Tatarstan. A large-scale project for the creation of the business platform Kazan Smart City is being brought to life. We also have in operation: 5 industrial parks and 9 technology parks; 8 business incubators; engineering centres (KAI Laser, the Eidos Medical Science Centre, and a planned chemical engineering centre). Work is being done on the development of nano- and biotechnology, the manufacturing of composite materials and robotic technologies. We will be happy to welcome Indian companies to Tatarstan for work at these innovative platforms. Has there been any mutually beneficial relationship formed between Tatarstan and any Indian state? There is an agreement currently in effect between Tatarstan and the state of Andhra Pradesh, and there is also a cooperation protocol between Kazan and Hyderabad. Undoubtedly, it is necessary to give a new impulse to the realization of the signed documents and fill them with real content. What prospects to you see in humanitarian cooperation, in particular, in the area of tourism and education? Indian cultural days are held regularly in Tatarstan, as well as performances of classical Indian dances and Indian music. Representatives from the Indian film industry regularly participate in the Kazan International Muslim Film Festival. A number of Tatarstan’s educational institutions cooperate successfully with India (278 Indian students study at Kazan State Medical University). We would be happy to see these numbers grow. The Kazan Federal University and the Jawaharlal Nehru Cultural Centre at the Indian Embassy in Russia are jointly implementing the Centre of Indian Studies scientific and educational project. Tourists from Tatarstan gladly visit Indian resorts. In turn, Indian citizens would be interested in our republic’s tourist destinations. The development of tourism could be facilitated by organizing regular direct flights between India and Tatarstan (for instance between Mumbai and Kazan).